“Ice Fury by Flysound” is a sound library of ice breaking to pieces in as full a variety of ways as possible. This is a thesaurus of the various ways ice gets undone, with blasts and crashes as well as scrapes and swishes and cracks and splinters too. 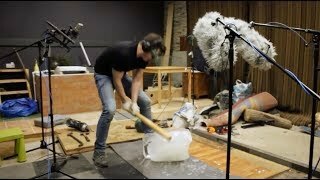 Ice Fury is recorded on two superb ultra low-noise Neumann D-01 digital mics at 96k/24bit in a fantastic foley studio. Our equipment and processing make it ideal for downpitching and other tweaking to match your project. Flysound is an independent sound post production team from Moscow, Russia. Mainly focused at feature film postproduction, we are trying to bring our unique quality and signature into every recording. We are using A-class equipment such as AATON Cantar X-2, Sounddevices 788T, wide variety of microphones, including Neumanns U87s, Sennheisers MKH416s and others.